Police gather evidence following an officer-involved shooting at 112 Grove St. in Bangor on Tuesday. The man shot Tuesday by a Bangor police officer during an altercation on Grove Street was charged Wednesday with domestic violence terrorizing. Brian James Barker, 40, of Bangor, the son of former Brewer Police Chief Steven Barker, remained hospitalized Wednesday at Northern Light Eastern Maine Medical Center. He was listed in good condition Wednesday. Brian Barker could appear before a judge on the charge by video conference at the Penobscot Judicial Center as early as Friday. He also could be issued a summons with a court date in several months. Additional charges are expected to be filed once police finish the investigation into the shooting, which began as a domestic disturbance call, Sgt. Wade Betters, spokesman for the Bangor Police Department, said in announcing that Barker had been charged. Barker, whose criminal history began in 2002 and ended 10 years ago, declined to comment from his hospital bed Wednesday afternoon. Barker was an honor student at Brewer High School in 1996, according to the Bangor Daily News archives. Six years later, he was convicted in Bangor of misdemeanor assault charges and fined $200, according to his criminal history report from the Maine State Bureau of Identification. In 2004, Barker was sentenced to two years in prison on burglary and theft charges. He was sentenced in 2004 in Bangor to four years with all but 23 months suspended but repeatedly violated his probation. Barker’s probation was revoked in 2008, and he was sentenced to four years in prison. His father refused Wednesday to discuss his son’s shooting or his trouble with the criminal justice system. Steven Barker, 62, of Clifton retired as Brewer police chief in 2006 after 29 years with the department. 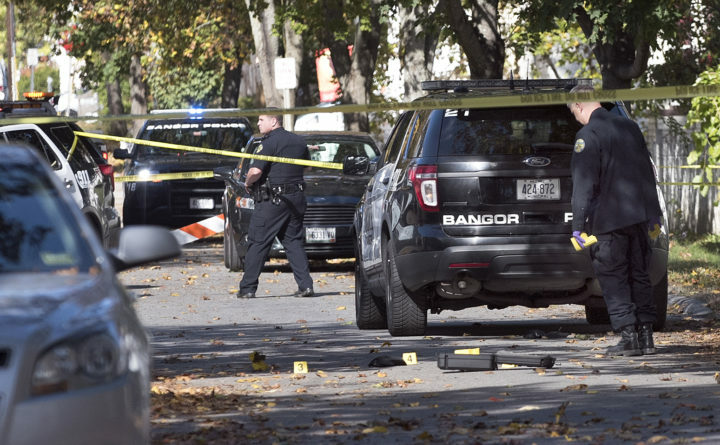 Bangor police were sent to 112 Grove St. around 11:15 a.m. Tuesday in response to the report of a domestic disturbance at the apartment building, according to Betters. When they arrived, a man holding a knife was walking away from the building, toward the intersection of Grove and Somerset streets, according to Todd Nadeau, who witnessed the shooting just yards from his home. Nadeau, a retired Maine police officer, watched the entire confrontation unfold about 20 yards from his driveway. He was in his garage when he heard shouting, he told the BDN in an interview late Tuesday night. Nadeau said when he walked toward the street, he saw two Bangor police cruisers in the road and three officers with their guns drawn, forming a “semi-circle” around a dark-haired man holding a knife, “screaming at the top of his lungs” and hopping back and forth, he said. The officers were about 30 feet from the man, who shouted “C’mon, do it. Do it. Let’s go,” over and over, interlaced with profanities, Nadeau said. In return, the officers repeatedly told Barker to drop the knife. Eventually, Barker lunged forward, “kind of like a body charge,” and the police fired “between four and six shots,” Nadeau said. Barker collapsed, clutching the area below his waistline, crying out that he’d been shot, Nadeau said. Police placed Barker in handcuffs while shouting for an ambulance, and paramedics arrived within minutes to place him on a stretcher, he continued. The exact nature of Barker’s injuries has not been released. Officer Dylan Hall, who shot Brian Barker, was placed on administrative leave Tuesday afternoon, which is standard procedure in police shootings, Police Chief Mark Hathaway announced. The Maine attorney general’s office is investigating, he said. That office limits the amount of information departments may release to the public while it is investigating. A written report is released once the office completes its investigation. In its more than 100 reviews of officer-involved shootings since 1990, the attorney general’s office has never found that an officer should face criminal charges. If convicted of the misdemeanor assault charge, Barker faces up to a year in jail and a fine of up to $2,000.